Once you force your mind to move beyond thoughts of “how old are those metal cables pulling this car, and at what age does metal start to deteriorate?”, you can enjoy a spectacular view of Montréal. 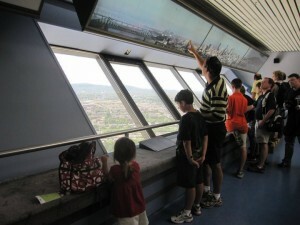 At the top, you can spend as much time as you want on the observation floor in front of window banks facing several different directions, with maps and descriptive guides indicating points of interest. On a clear day, visitors have views within a 50 miles / 80 kilometre radius, including the Laurentian Mountains. It’s easier up here to appreciate that Montréal is truly an island, surrounded by smaller islands. You can see the Saint Lawrence River snaking its way around Île Sainte-Hélène and Île Notre-Dame. Each kid got a “Loonie” to put into those binoculars which provide a frustrating pinhole vista. I’ve never seen the point of those things, but our children like putting money in shiny machines. Matt gazed longingly at the casino on Île Notre-Dame, which we were not able to fit into the itinerary. Language differences are, apparently, not a barrier to a good poker game. Matt: the architecture of the tower and the mechanics behind the funicular. Stephanie: the view, and the opportunity to say the word “funicular” several times in one day. The Boy: reconnecting with terra firma. The observation floor had several banks of windows like these. 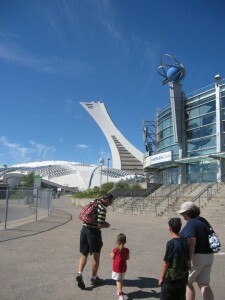 The tower is part of the Olympic Park (“Parc Olympique”) built up in advance of the 1976 summer Olympic games held in Montréal. 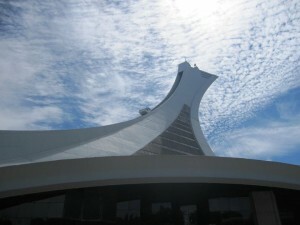 However, the tower and its observatory were not actually completed until 10 years after the games. Since its inauguration in 1987, over 4 million people have visited. The funicular travels at a rate of 9 feet / 3 metres per second, so the ascension only takes two minutes. Which was just long enough for me, thank you very much. On the car ride home, I took a poll, averaged the scores, and got 8.5. Even us chickens were generous, so relieved were we to have survived. It really is an amazing view, and a unique experience! I would not only recommend it, I would go again…maybe. You can see more photos of this adventure on the Go BIG or Go Home Travel Blog page on Facebook. Brave smiles before the climb. Ha ha ha. 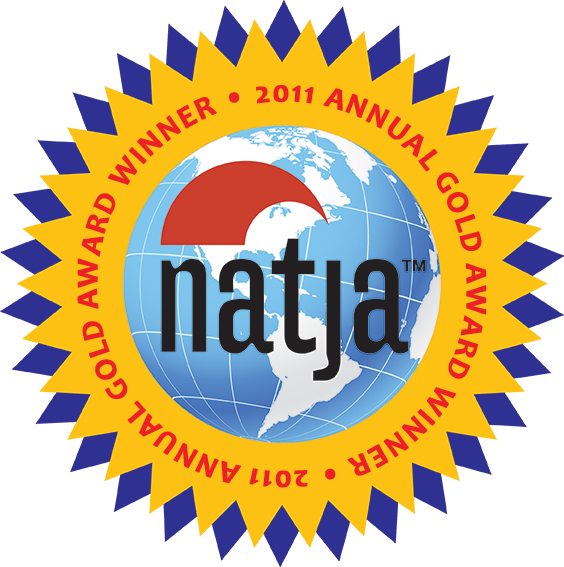 I loved the zone defense – three adults vs. two kids. We recently had an “emergency poop” in the most ghetto bathroom in all of Gary Indiana. I think the kids are in charge, really. Fun post! Lol! Great post. Easily the most interesting description I’ve ever read of the experience. Thanks for sharing! Thanks, Evelyn! Coming from you, that means a lot to me! I completely understand how you feel! Riding up the Gateway Arch in St. Louis in a tiny pod had me rather shaky. 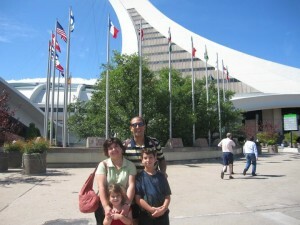 My thrill-loving family, however, relished every bit. This looks incredible. AMAZING! I had no idea this even existed – and your intro was hysterical! Thanks for linking up to Finding the Funny. Hope to see you next week! Thanks for stopping in, fellow chicken! There’s a lot of talent on #findingthefunny. Don’t know if I can keep up! THis place scares the hell out of me. I don’t really fear heights, but I do fear seemingly impossible feats of architecture that could just topple over at any minute. And I too have wondered about the strength of metal cables when I’ve been on a gondola/ski lift. So many what ifs! Found you on Anna and Kelley’s funny linky. Thanks for stopping by! I always welcome reassurance that I’m not the only one who fears metal deterioration!